In hand tools. A small saw for cutting curves. 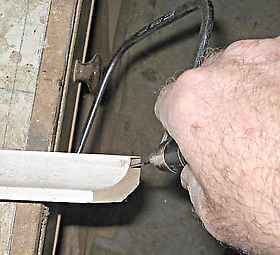 Typically for scribing around mouldings on skirtings (baseboards) and cornices (crown molds). A small and cheap saw, but part of every carpenter's or joiner's tool kit. At the right is a shot of a saw cutting a scribe on a peice of wooden cornice or scotia. So far I have not seen any power tool that can do the same jobs as these saws. I have seen guys using electric jig saws and 100mm grinders etc. but they do not come close to using one of these for speed and accuracy. A detail at the handle end of the blade, showing the direction of the blade. The teeth point to the handle and the cutting is done on the pull stroke. 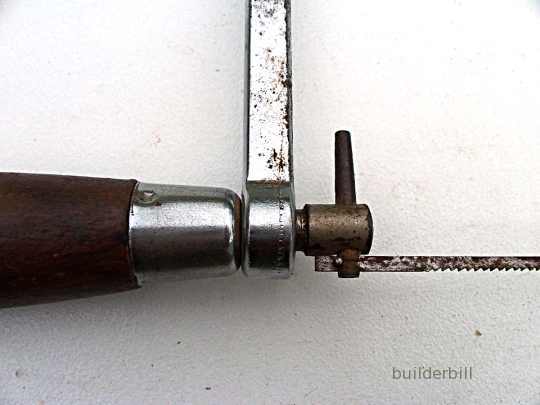 More information on scribing and how to use a coping saw.